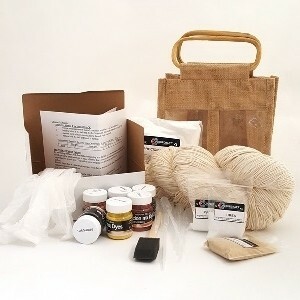 Everything you need to start dyeing vegetable yarns or fabrics made from cotton, linen, viscose, hemp and silk plus a 250g skein of 4ply cotton. The kit contains full instructions, 10g each of 6 full intermixable MX procion dyes, 300g fixer, urea, thickener, salt, pipettes, a sponge brush, disposable gloves and 250g of 4ply pure cotton so you can start straightaway. The cotton included in the kit is enough to knit or crochet a sleeveless summer top or wrap and we’ll include links to free online patterns within the kit. A kitchen, bucket or pans, lots of space and time and some undyed yarns!